Need an Easy Way to Boost Conversions, Sales and Profits Online? Did you know that 71% of all ebooks sold in the United States are sold through Amazon? And that ebook sales are steady, despite what publishers are telling the industry. In fact, self-published authors are not only replacing publishers in the bookstore, they’re taking more of the profits. It’s true, authors have learned that they can package and sell their books directly through Amazon’s Kindle program and keep more of the profits than they would if they went through a traditional publisher. Additionally, when you publish with Kindle, you control the timing of the launch and promotions. You control the price, and you can update and revise your book whenever you want to. This means that it makes really good sense to get several titles listed with Amazon and to work hard to make sure that at least one of them is a Bestseller. This same report found that more than 4,600 authors are earning $25,000 or more from their ebooks on Amazon. While that may not be a living wage for some, it’s a great way to earn money doing something that you love and it’s also a tremendous supplemental income. And, 2,500 authors are currently earning $50,000/year or more from Amazon ebook sales. How’s all that for motivation? Do you have something to say or a story inside you that you’d like to get out? Do you have specialty knowledge, experience, or resources? There are many reasons to write a book. For example, you might work in real estate and you know that at least a dozen different agents have tremendous advice and experience. Their information could help the careers of other aspiring agents. You could interview them and create a book. Or maybe you coach a team sport. You can share your tips for getting into the coaches’ mindset, for motivating a team, or for inspiring others. There are so many reasons to write a book. If you’ve ever been inspired to write but thought that it wasn’t possible or that perhaps it was too much work, guess what…? Things have changed. The digital publishing world has made being an author something that is accessible to everyone and if you have something to share, you can publish. Insider's Strategy Guide: Discover the many benefits of publishing on Kindle. Learn the 5 strategies for dominating Kindle in your genre. 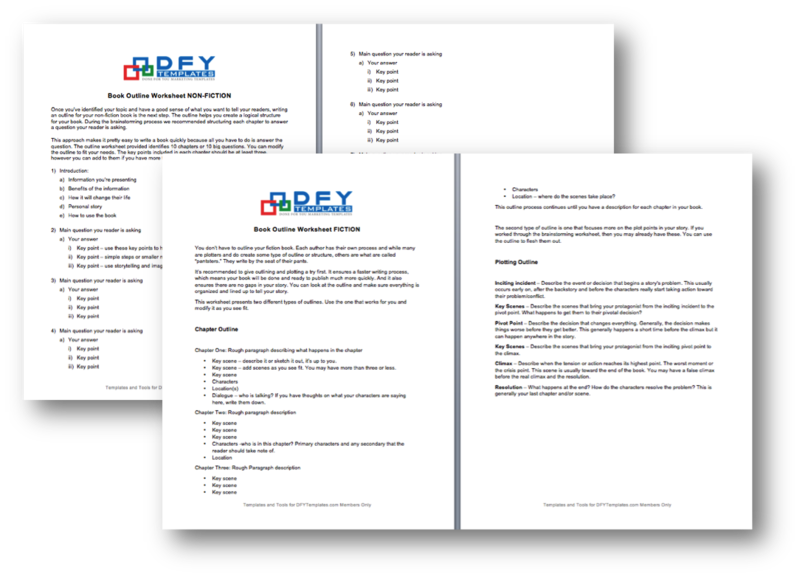 You'll also learn how to put the templates and checklists to best use. Author Bio Page Templates with Sample: Your author bio may be one of the most difficult things you write. It’s one of the reasons many authors outsource this project. It can be difficult to write about yourself objectively. That’s why we included this template and also gave you a sample to get you on your way. 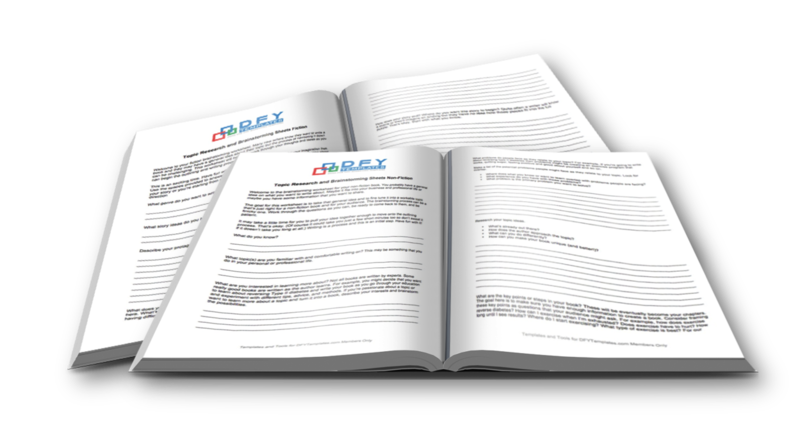 Book Information Page Template and Sample: Your books information page plays a key role in helping people determine whether they are interested in reading it. They need to know what they have to gain. In this template and sample we have included the key points you need to include on your book information page. These fill in the blanks worksheets will help you create a logical structure to your book. Outlining can ensure a faster writing process which means your book will be ready quicker! You can modify the outline to fit your exact needs, but this will get you on your way. Topic Research and Brainstorming Sheets: Many new writers know they want to write a book and they have a general idea about their topic but the process of narrowing it down can be challenging. 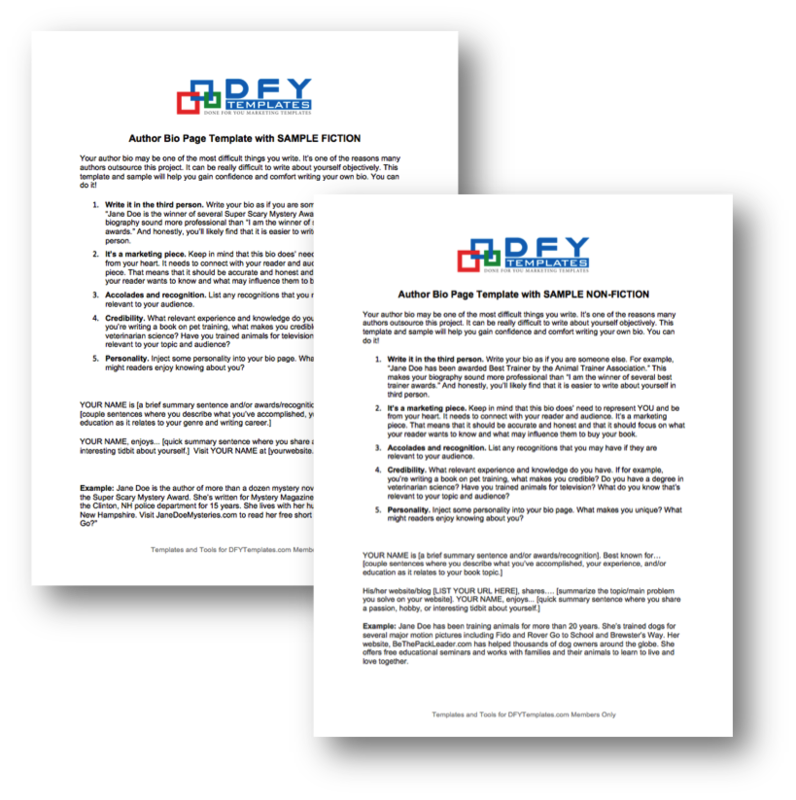 These worksheets will help you work through your thoughts and ideas so you can begin the outlining and writing process. 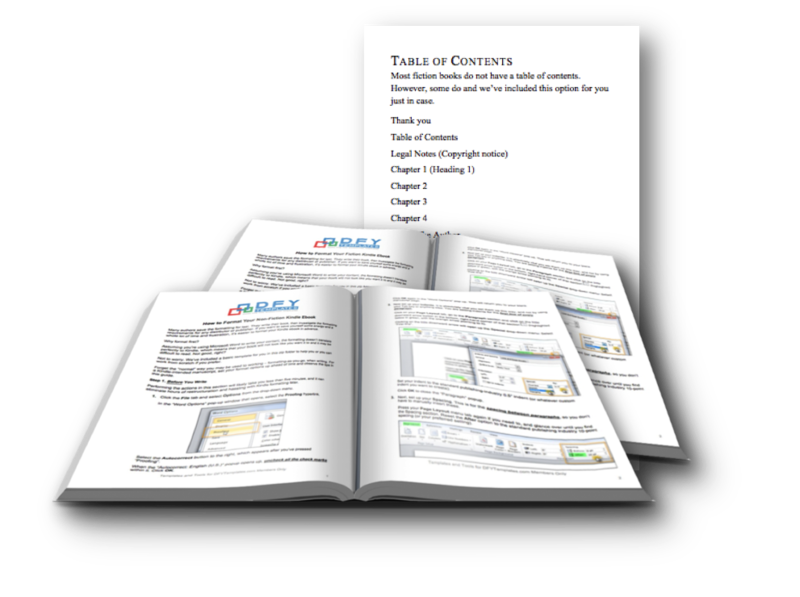 Kindle Formatting Guide and Templates: The thought of formatting a Kindle book is overwhelming to many. The key is to format your book as you go using the tips in this guide. It will walk you through the formatting options to save yourself a ton of time later. Kindle Publishing Checklists: There are many steps to take to publish your book on Kindle. 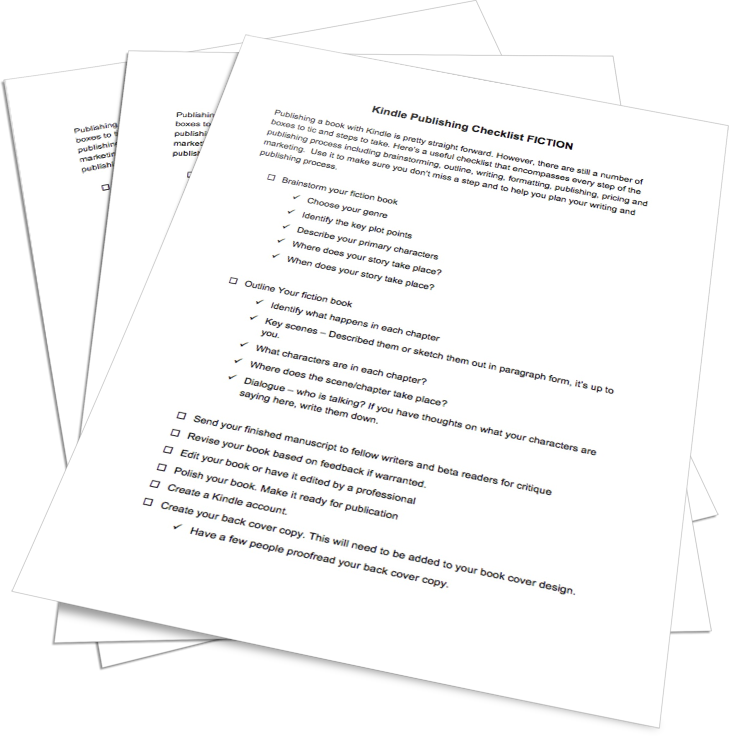 These checklists encompass every step of the publishing process including brainstorming, outline, formatting, publishing and pricing and marketing. 10 Book Cover Images & Templates (JPEG & PSD): Creating your book cover can be a time consuming process if you aren’t graphics savvy. 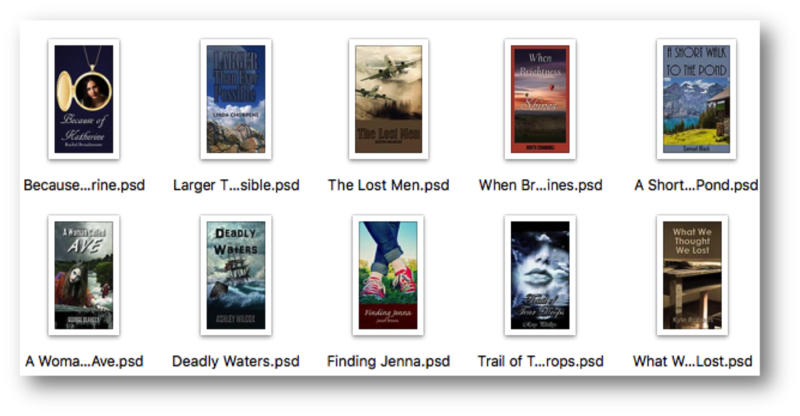 That’s why we included 10 sample covers you can use and edit as your own (5 for Fiction and 5 for Non-Fiction). Get some inspiration and a place to start! We offer convenient options on our template packages, whether you want to use the content for your own business, to work on client businesses or if you want to edit, brand and resell the templates. Just choose from your options below to instantly access your package. 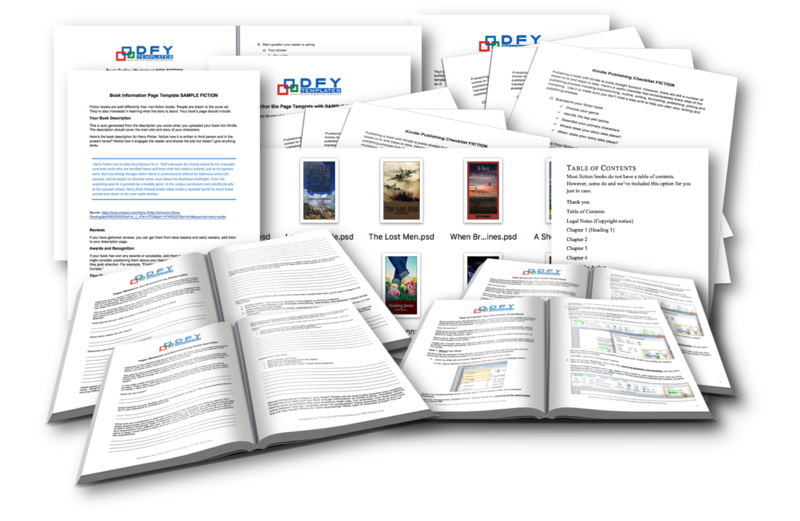 Template package to help you publish on Kindle. Insider's strategy guide, so you can make the most of the templates. 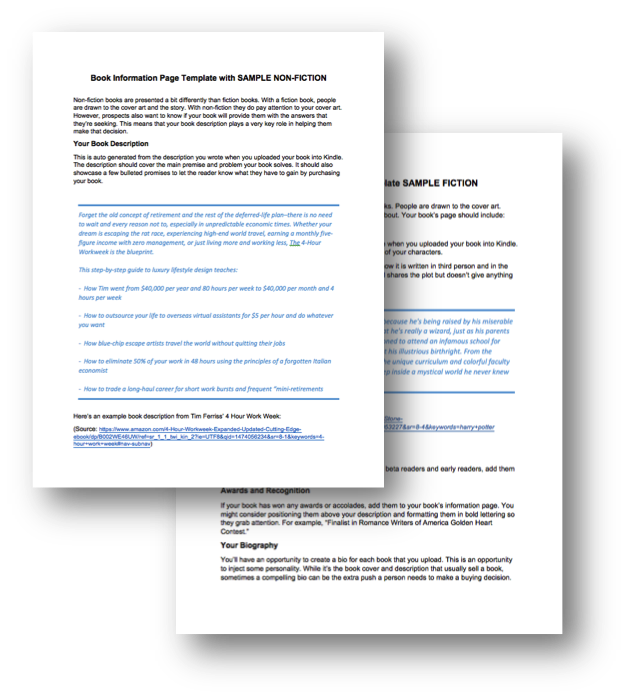 Full rights to edit and use the templates to market your own personal business only. Full rights to edit and use the templates to help your clients market their businesses and for your own business too. Full rights to use the templates to help your clients market their businesses and for your own business too. Full rights to edit, brand, and resell the templates as your own. There are limitless ways our template packages and strategies can help you grow and connect with your audience...and help you sell more products. Let's just look at a few of the strategies that can help you save time and work more cost-effectively to get BIG results for your business. Imagine starting your work day with much of you work done for you. There's no need to wonder on what to focus on or how to do it...just fill in the blanks, follow the instructions and you're ready-to-go. All our templates are backed by our decades long experience. We've tried it all and know what works and what doesn't, so there's no need to go through trial and error and wasting time on strategies that simply don't work. As a busy entrepreneur, you know that it's not possible to do ALL the tasks for your business and do them effectively. It's easy enough to say you should outsource, but then you have to do the training. And when faced with that daunting task, it's often easier to just say, "I'll just do it myself." There are only so many hours in a day and you can only fully develop so many skills. Instead, take our templates and give them to your contractors or staff...and let them run with them. Problem solved! 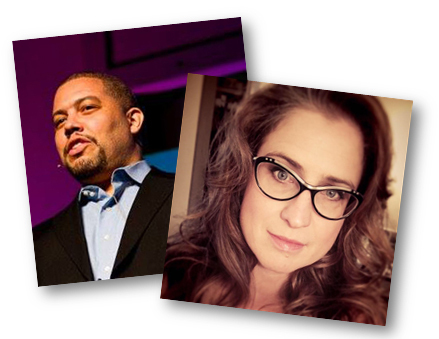 Here's the perfect way to boost your value to your clients: Just get them more results. That's easy to do when you have the proven templates that not only will help you get more results for your clients...but they'll make you more efficient and give you more time to add even more value to your client service. And as you continue to save time, bring more results and charge more for your services as a result, you can easily scale your business by hiring help to deliver client service. After all, you've got the results-getting templates they can work from and training your team is simple. If you happen to teach Internet marketing, we don't have to convince you just how priceless these templates are. But imagine the time and work that would go into creating such tools. Actually no, don't imagine it because you don't need to do it. We've already done it and if you're looking for private label resell rights to our templates, we've got them for you. That means you can sell them to your customers to use in their own business. You can pass them onto your paid coaching clients. Or you can use them to the boost the value of your existing products. We've done the work for you, but you can edit and brand the templates as you wish...so run with it. Note: DFYTemplates is a new project, based on the same strict quality standards our current customers are used to. The comments above are from customers who have purchased our previous products. P.S. Stop working so darned hard. We've put the work in, made the mistakes you don't have to and put that experience into these proven templates to keep you on task with growing your business. Click here to get started. Copyright © 2016 DFYTemplates.com. All Rights Reserved.